Minto Group Inc. - Looking for things to do in Kanata? There’s no need to head into downtown Ottawa if you’re looking for something to do. Kanata has a wealth of options to satisfy everyone from sports fans to fashionistas, families, to fans of the great outdoors. Plus, Arcadia is in the entertainment district in Kanata — what more could you need? Across the road from your community is the 80-store Tanger Outlet outdoor shopping centre. You’ll find the best stores and factory outlets from your favourite brands like Adidas, Calvin Klein, Eddie Bauer, Michael Kors, Nike, Roots, and a great food court when you need to set some bags down. 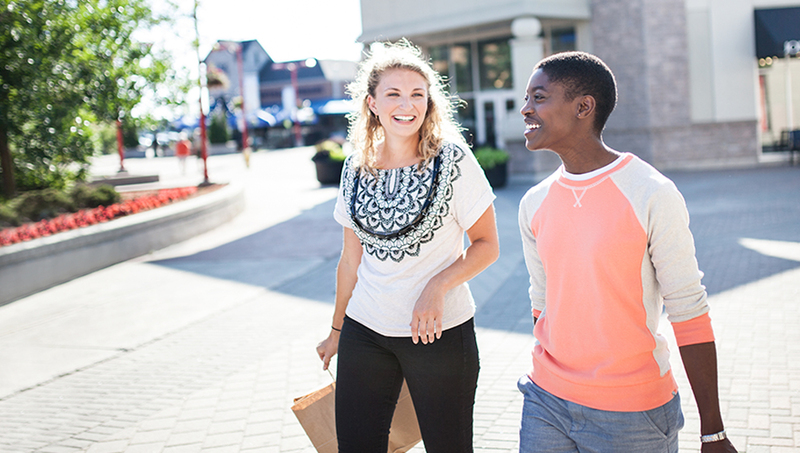 Hang a right to go north on Huntmar Drive to Terry Fox Drive and you’ll find even more shopping opportunities at Kanata Centrum Shopping Centre. Here, you’ll be able to grab a bite to eat with friends at a number of family-friendly dining options like Kelsey’s and Montana’s. Pick up groceries at Loblaws or Walmart, or buy a book and sit down with a Starbucks latte at Chapters. Each shopping centre is less than five minutes away by car, so you can take your time and still be home by dinner. And when you need to do some serious shopping, there are a Costco and Home Depot side-by-side just 10 minutes down the road. Kanata is the place to be for sports and recreation. Home of the Ottawa Senators — who play a home game at least once a week during their season — the nearby Canadian Tire Centre is a one-stop destination for live hockey nights, concerts and shows featuring A-list stars, and kid-friendly performances. Show off your swing at the city’s only fully-lit course at Thunderbird Sports Centre. Work on your stickhandling in international and NHL regulation-sized rinks at the Bell Sensplex — there are even hockey and skating programs for all ages so you can get your game right. More of an outdoorsy type? Grab your supplies from Cabela’s outdoor outfitters before you set out on the Ottawa River in the east or hike through the South March Highlands, an eight-minute drive to the north. There is some incredible nature that surrounds Arcadia, like chances to get up-close and personal with wildlife, trails open year-round, and parks you and your dog will enjoy. The arts scene is thriving in Kanata. Let the Kanata Theatre company dazzle you with a performance at the Ron Maslin Playhouse. Wander through the Kanata Civic Art Gallery exhibits featuring original works or consider joining the community-based Kanata Symphony Orchestra which plays everything from classical composition to pop music. Looking for a good school? Kanata has a wealth of options for your child whether you want to send them to Public, Catholic, or Private school, in English or French, from elementary to high school. Some of the closest to Arcadia is Castlefrank Elementary, St. Isabel Catholic Elementary, and Kanata Academy Private school. Arcadia is a quick, one-minute drive to Highway 417 off Palladium Drive and, from there, getting around the city is a breeze. Surrounded by nature, there is never a shortage of outdoor activities to give you a breath of fresh air.